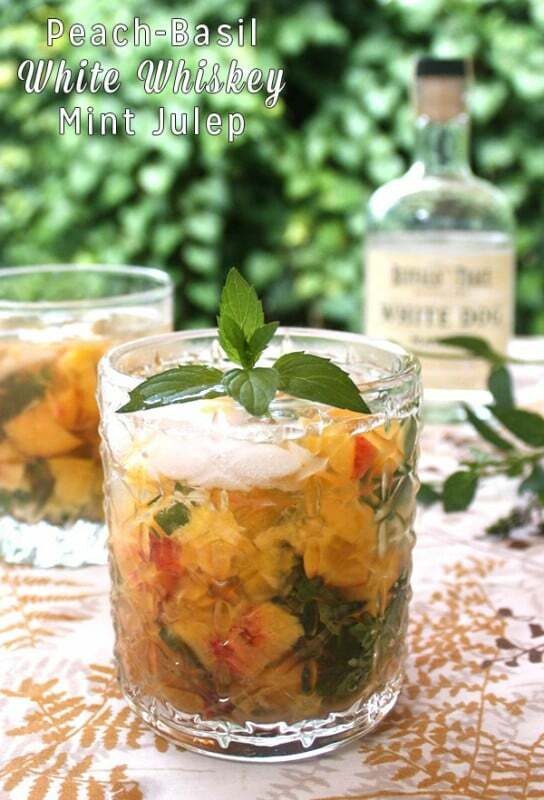 Fresh peaches and maple syrup with garden mint and a splash of white whiskey. What a lovely way to soak in the end of summer! 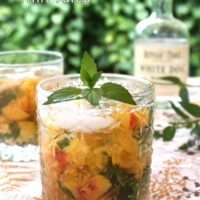 A white whiskey mint julep with some sweet peach and maple goodness! 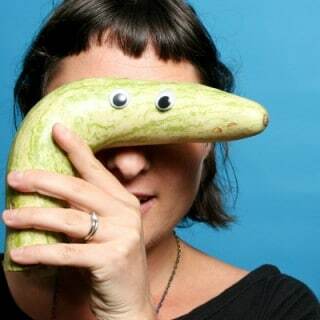 The VeganMoFo theme for today is weird food combinations. Peach-maple-whiskey is not really a weird combo, but for me it is, in a way. Let me tell you a sad story. I am allergic to brown liquors. Whiskey, bourbon, and rye all make me throw up. Not in the “I drank too much and threw up” sort of way. The nausea is almost instant. Even drinks with a tiny amount of brown booze turn my stomach, and my little sister, Amanda, has the same problem. Me making anything with whiskey in the name is kind of weird. And exciting! Amanda and I texted back and forth about this cocktail for a good part of the morning. We were brainstorming end-of-summer peach cocktail recipes, because I’m going to miss peach season! I love peach and maple together, and this combo seemed to scream for whiskey. As we were workshopping this idea, she told me that white whiskey was a thing, and that she can drink it without getting sick! It turns out that white whiskey is just whiskey that’s not aged. It’s the aging in oak barrels that gives brown booze its brown-ness and – my sis and I are pretty sure – what makes us sick when we drink it. 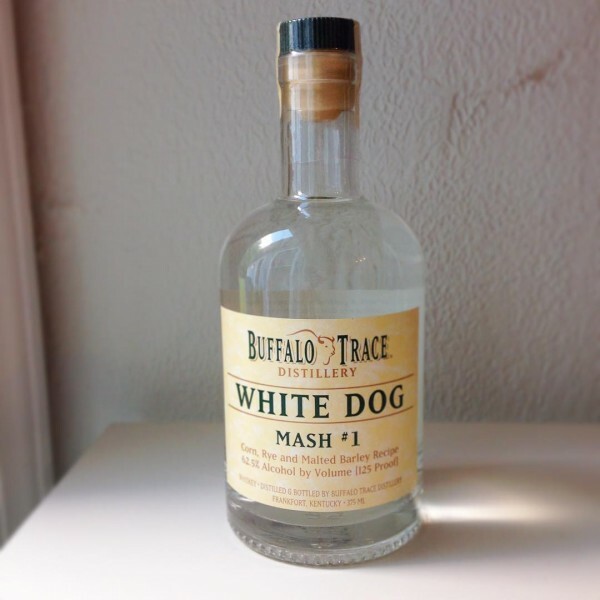 Brown booze lovers tend to scoff at white whiskey, but for me, this was a revelation! I can make whiskey drinks! And drink them! White whiskey made with the same stuff that goes into brown whiskey: corn and mash. Sometimes it’s called moonshine or just mash, rather than whiskey. Whatever you call it, you need some for this cocktail. This white whiskey mint julep is based on a basic mint julep with some tweaks to make it a little bit more mellow and summery. Mint juleps in general are a lot stronger than most of my cocktail recipes. There are three shots of booze in one small rocks glass. It’s a delicious drink, but strong. Did I mention that it’s strong? Make this drink as directed, but skip the ice in the official recipe. Pour half of it into a tall glass halfway full of ice. If you like a stiff drink, though, go for the full-strength version below! 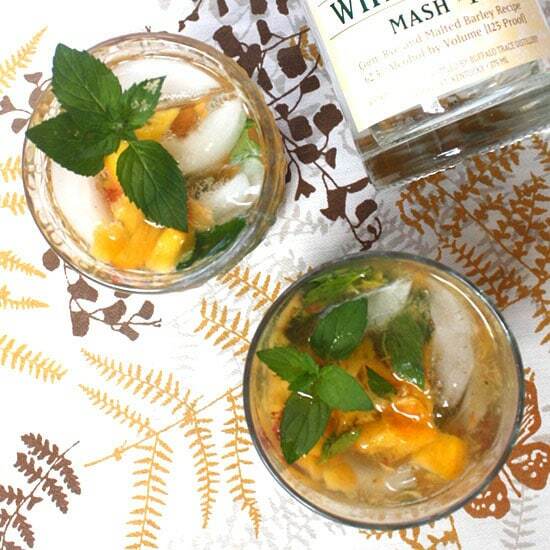 In a rocks glass, muddle together the mint, maple syrup, and peach. Add the whiskey and stir. Top your glass off with ice, then add the water and serve, garnished with more mint.